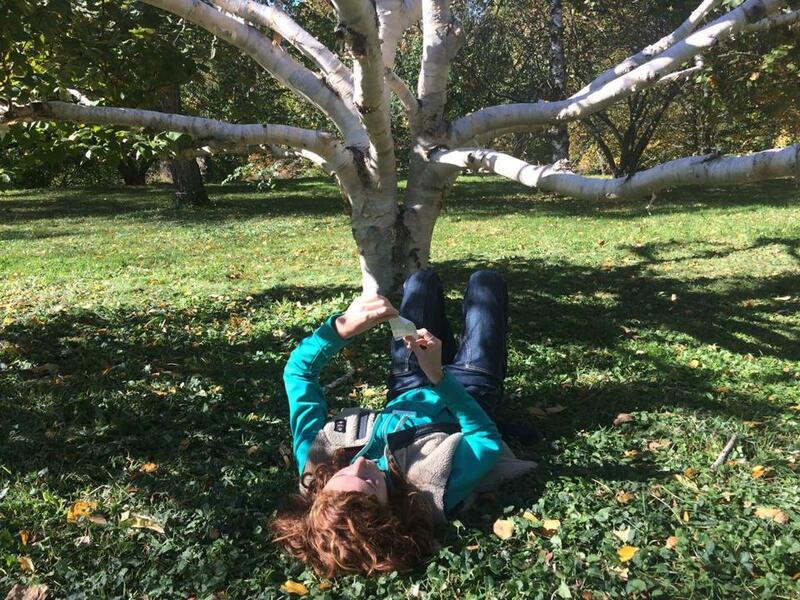 Brooke Scibelli of Jamaica Plain spends some quality time with a tree at the Arnold Arboretum last October as part of a forest bathing session with Toadstool Walks. Scibelli engages with a tree from another angle. Few activities go by a name that is as comprehensive as “forest bathing.” The practice encourages immersion in the natural world, a mindful meditation that embraces our surroundings rather than excluding them. While recovering from cancer treatments several years ago, Mazzola learned about “phytoncides,” described by the National Center for Biotechnology Information as “aromatic volatile substances” emitted by trees that boost the “natural killer” or NK cells in human immune systems. Certified by the Association Of Nature and Forest Therapy as a guide for such therapy in 2015, she then founded New England Nature and Forest Therapy Consulting . Mazzola has led forest bathing sessions for students, people affected by brain injuries or cancer, inmates at South Middlesex Correctional Center, seniors and assisted-living residents, corporate programs for team-building or stress-management strategies, and even dog owners. 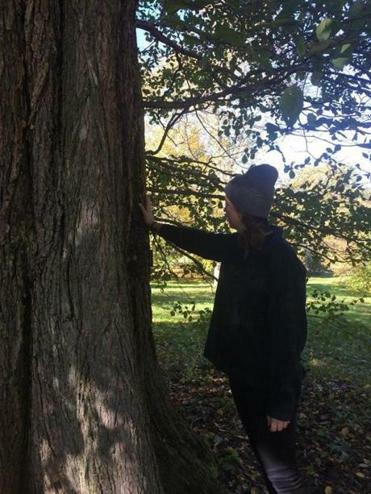 “I feel so nurtured and supported by, and appreciative of, the living world, the forests,” she said. 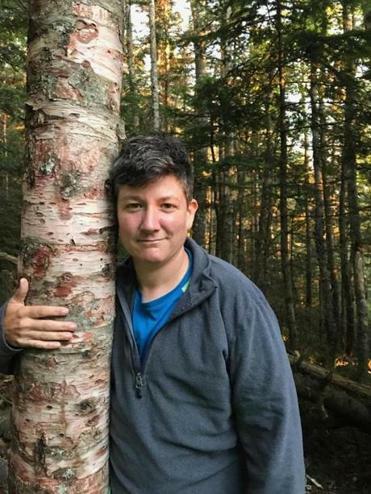 Jamaica Plain’s Tam Willey of Toadstool Walks said anyone can benefit from forest bathing, but those benefits increase with repetition. Certified forest therapy guide Tam Willey in the woods last summer. “Forest bathing is most effective when practiced regularly over time,” said Willey, a certified forest therapy guide. “It takes time to build up NK cells in the blood and lower the production of stress hormones. The more time one spends absorbing the phytoncides released by trees, the more lasting the results can be in our bodies. Willey said she discovered forest bathing, or Shinrin-yoku, in 2016 when she signed up for a daylong outdoor retreat. “We met at a forest just outside of Boston, and our meditation teacher began by introducing us to Shinrin-yoku and led us through some invitations,” she said. “The practice immediately clicked for me. 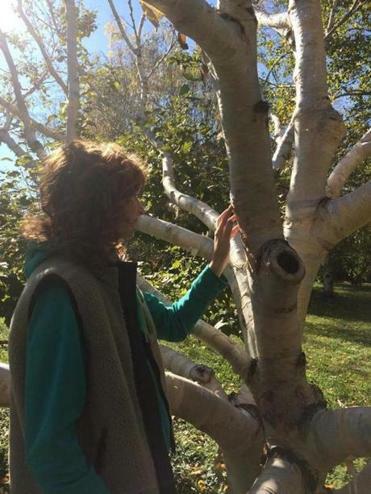 Annie Meyer, a woodworker and teacher from Watertown, touches an Arnold Arboretum tree last October. West Roxbury’s Laura Campagna, an astrologer, grew up in Brookline, and has visited the Arnold Arboretum in Jamaica Plains since she was a child. “But my forest bathing experience with Tam [Willey] allowed me to see the land through completely new eyes,” she said. “At the beginning, we sat and set an intention for the experience. Tam described the fascinating history of forest bathing in Japan, and explained which path we would follow through the park,” said Campagna. “At various points we stopped, and Tam lead led me through a series of mindfulness exercises that included listening, talking, and writing. For Watertown’s Annie Meyer, a studio artist and woodworking teacher with Massachusetts College of Art and Design and Eliot School of Fine & Applied Arts, forest bathing provides an intimate bond with her work. Willey leads regular forest bathing walks at the Arnold Arboretum, but like Mazzola, is also partnering with groups such as the Trustees of Reservations , the Massachusetts Audubon Society , and the Appalachian Mountain Club to offer similar sessions throughout the eastern suburbs, including Moose Hill Wildlife Sanctuary in Sharon, Yoga Space at the Farm in Canton, and along the Bay Circuit Trail. To find a local forest therapy guide, visit natureandforesttherapy.org/find-a-guide.html. If you have an idea for the Globe’s “On the Move” column, contact correspondent Brion O’Connor at brionoc@verizon.net. Allow at least a month’s advance notice.